Do you have stashes of garbage in your car door compartment? How about in the center console? Does it just bug you? It drives me crazy. I hate the pieces of trash everywhere (especially the small pieces like gum wrappers, post-it notes, receipts, etc)………..so I genuinely needed a solution. Here’s something worth a try. A little bag to attach to the back of your head rest. That is always propped open. And it’s fabric, so if you happen to get something sticky in there…..pop it in the washing machine. Start by cutting a back piece of fabric measuring 10 x 13 inches and a front piece that is 12 x 13 inches. Along the 12 inch side of the front piece (the bottom), find the center and pin it. Then measure out 1 inch on either side and place another pin at each spot. Then measure out another inch from that and place more pins. So you now have 5 pins, all an inch apart. First, fold over your fabric from the 2nd pin from the left over to meet the first pin on the left. Then do the same with the 2nd pin from the right, over to meet the first pin on the right. Now you’ve got 2 pleats that will be at the bottom of your bag. Then, place your front piece together with the back piece, with right sides together. Pin along the bottom and sides. Sew along the 2 sides and the bottom with a 1/2 inch seam allowance. Clip your 2 bottom corners. Then do a zig-zag stitch close to your seam. Trim the excess fabric away. Turn right side out and poke your corners out with a pencil (or something similar) to make them sharp and crisp. Then, fold your front top edge towards the inside, 3/4 inch. Then fold it down another 3/4 inch, creating a casing for your boning. Pin it into place and then sew along the bottom fold, securing the casing into place. Don’t sew the back side yet. Then sew one end of your casing closed, right by the seam where the front piece and back piece meet. Cut an 11 inch piece of boning and slide it in your casing, making sure you slide it in the right way, making the boning push outward. Then sew the other end of the casing closed, on the other side where the front and back pieces meet. If you need to trim your boning to fit better, go ahead and do so but the boning needs to fit in there pretty snug. Then, fold down your back piece the same way (3/4 inch, and then 3/4 inch again) and sew it into place. Then cut two pieces of ribbon (I used grosgrain)……you might need to measure your seat and headrest and see how long you’d like it to hang down. I cut each of my ribbons 8 inches long. I heat sealed the ends of the ribbons and then attached them towards the outer edge of the bag so that it would hang well in the car. (**Or you can just make strips of fabric.) Then I attached velcro to the other ends of the ribbon. You seriously amaze me with what you come up with! Love this. Love this idea! You always have the CUTEST fabric! Where do you get it?? This is AWESOME. I am going to have to try this one!! THANKS!! You always have the greatest ideas. You’re so welcome. This one really came from wanting to keep the crud out of the nooks and crannies of our car. Yuck! 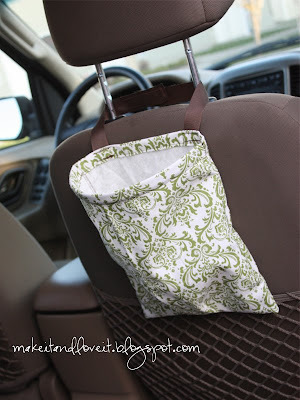 How are you soooo creative…Im seriously going to make one for every head rest in my car!!! Super cute!!! You and soooo amazing lady! yeah ha! I love following you! Can you get any AWESOMER? I don’t think so!! THANKS! You’re amazing. I just cleaned my car out this week and meant to look up a how-to for one of these. This is PERFECT and I love where you placed it. Thanks bunches, you’re a rockstar! I’ll be linking. Great idea. I love that you don’t go to the store and buy things, you just make them yourself. Cool. Tallmama – I posted a link in a comment above. Just scroll up a bit. Good luck!! Love it! Thanks for the motivation to clean out my car! I just wanted you to know i LOVE your blog… thats all! I just found you!!!! I LOVE IT! You are amazing. Any tips on how to recover a couch? I just found your blog this morning and spent ages ooo-ing and ahh-ing at your projects. I love them all and can’t wait to get started on trying some. Looking forward to following your blog and reading more posts! Great tutorial! I wish I would have seen this last week! I just bought one on Etsy for close to twenty dollars! Im always looking for gifts for my son and for fathers day(mothers day)This is just the ticket loved the tutorial. Thank you so much for showing us how. I really don’t want to buy the boning to keep the bag open, so I was thinking about using my OLD UNDERWIRES. I was just getting ready to throw a bunch of bras out when I noticed your project. Very cool! I so need this for my car. Might have to steal the boning I’d set aside for nursing covers, for this! Thank you for the idea! I really have to try this. I use a gift bag…the type from the stores. This would be perfect for my dd especially since she can reach it. the project is cute, but think about cleaning it everytime it gets full..
i have three kids and the car gets downright messy evry time we go somewhere.that little cutie isnt going to hold the trash of even one trip..the juice boxes, the straws, the plastic that covers that,the “artwork” they do in the car, the snack wrappers, etc. my solution- bring a grocery plastic bag everytime you leave the house. put the trash in there, throw the bag in the bin when you get back home. i’ve given this “job” to my middle daughter, who is four. thats so much less work for me. now if i want more cupholders in my car, i will use this tute(without the boning) to make a few. good idea! i have seen people use an empty tissue box as a small trash-can in the car. the trash does not get out, and you can just throw it away when it gets full. I just made two of these to give away as gifts; they are awesome! My husband saw one I made for a family with fabric of their fav football team, and now he wants me to make him one for his car. Thanks for the tut! This is adorable–great tutorial! Thanks for sharing! Thanks for this amazing design, I just made one for a belated Christmas present for my sister. I posted a link to share your tut at my site in the sewing section. You can also grab an "I've been featured badge" if you'd like. Hey this is a cute way to reuse that Hooter Hider! LOL!! Seriously, you're too much. I love your site and am always blown away by your creative ways. Funny, I was just talking to my husband and saying I needed to have a little trash bag for my car. I just found your site and viola! Here's a bag. Thank you so much. i love your idea of using boning to keep it open…. but i have a silly question- how did you 'heat' seal the ends of the ribbon??? Hi Shannon, no, that's a great question. Sometimes I forget to add that. I heat seal my ribbon ends with a lighter. Just hold the end of the ribbon near the flame until it slightly melts the end. This will keep it from unraveling. My husband is always on me for the way my car looks… as I am the one who has the kids all the time… its a tad messy! Love this idea. Last year for christmas I recieved somthing that had a thick ribbon on it with velcro… guess what I kept for just the right project! And instead of boning I like to recycle my plastic butter tubs! Viola! Simple and recycled! Perfection! found you via- southern mammas! followin via google friends- will you take a min and do the same? All roads lead back to make it and love it! Most of the time when I do a google search for something,your blog is one of the first places that pops up. I totally love it! I am featuring it on my blog to help with Keeping America Beautiful Month! Great idea! But what if the trash was wet? wouldn’t it leak through? What could we do to prevent it!?? You could easily line this with a super cute laminated fabric that could easily take care of the wet trash problem and be easily wiped out! Or make the thing from laminated fabric as well. love Love your site! …or line it with a bit of clear vinyl. Instead of boning, I used plastic strapping from cardboard shipping boxes. Works great, and creates a use for something that otherwise has no use. It can also be creased to create squared corners. If you don’t have any, it should be available for the asking at stores. For the boning you could also use strips cut from empty milk jugs. I use the plastic for all kinds of things. I cut shapes for organizing tags, strips for plant markers, flat sides make great stencils, cut the top off with about 3-4 inches turn over and you have a funnel…. the list is endless! I just made one. It’s absolutely perfect! Where do you buy yours.? This is it! I’ve been trying to decide what to make to organize my laundry room–presently using unlabeled plastic store bags. I’ll add an embroidered label one each of 3: “Trash”, “Baggies” (local thrift shop asks me to save baggies newspaper comes in), and “Dog Bomb Bags.” I’ll have to post before and afters. My Mom made something very similar to this but she lined them with vinyl which helps keep the bags cleaner and later could be washed on gentle. For one car she used a “hook” to attach to an air vent and for another car used elastic to place over a knob. After 5 years they are still in use! I just finished making one. It turned out really cute. I did go a little different on the strap. I used the same fabric as for the bag and put a patch of velcro on the inside back seam and put a longer strip of the soft side on one end of the strap. That way, there’s only one strap, which is adjustable. Also, I lost the piece of boning I bought just for this project, so I used an 11″ piece of 1/4 inch oxygen tubing. I used to care for someone who used portable oxygen and had some on-hand. Great! 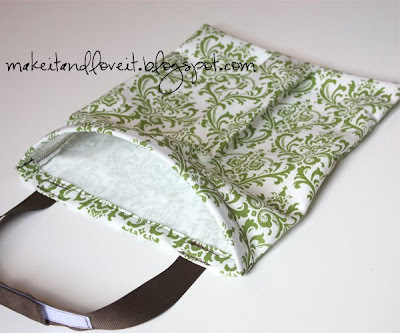 I’ve been looking online for a simple DIY clothespin bag, nothing that I’m really liking. Then I found this – I will change up the straps and this is perfect! Thanks! !